Home is not just where your hang your own hat. Your home is a place for entertaining guests. Don’t miss out on opportunities to make an impression on those guests in the areas you know they will visit. When you entertain large groups, two areas are always guaranteed a visit: the bar and the guest bathrooms. 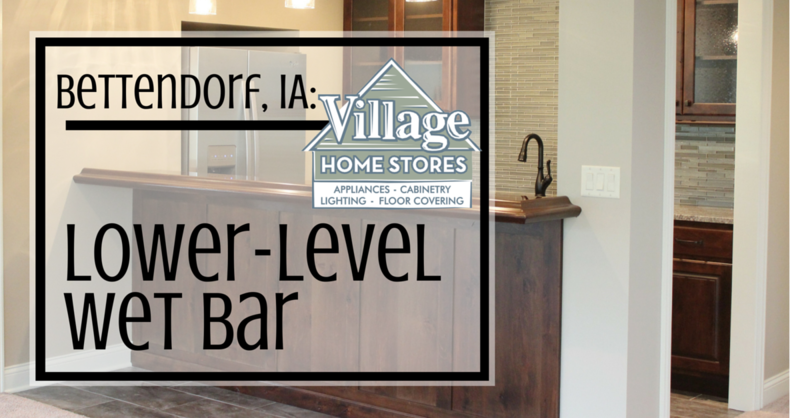 We wanted to show you around a wet bar located in the lower level of a Bettendorf, IA home built by Kerkhoff Homes. 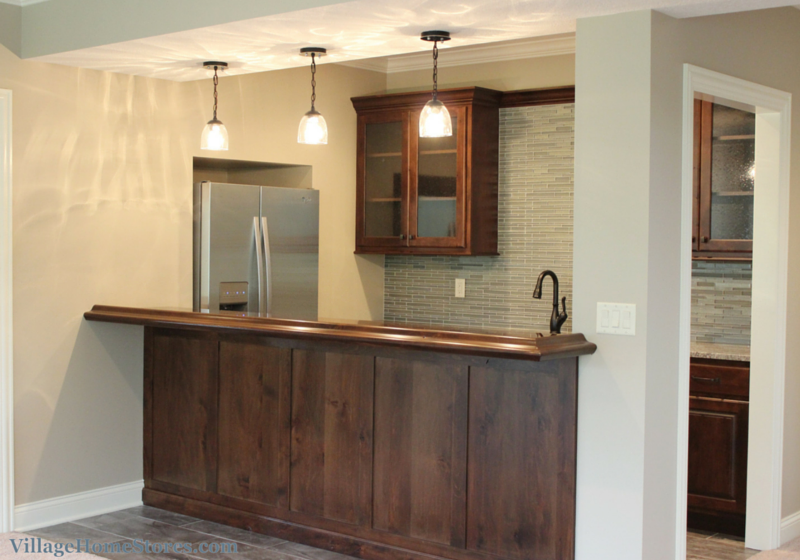 This wet bar is a great example of how just a few basic design details can step up a space to become functional AND memorable. Sometimes the last spaces designed in your home can become the most visited once they are complete. Building a new home or taking on an extensive remodel can leave you exhausted when it comes to making decisions. 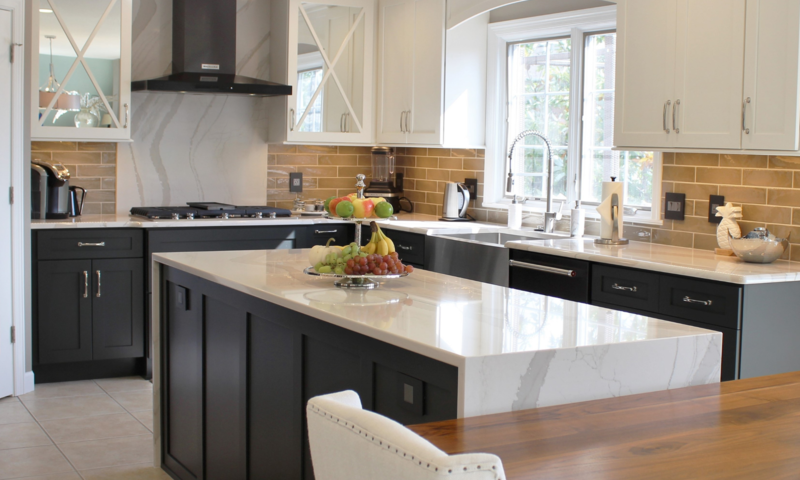 By the time you are finished making selections for the kitchen and main bathrooms you can easily run out of opinions. Your expert team at Village Home Stores is here to make sure every space in your project has that designer touch. 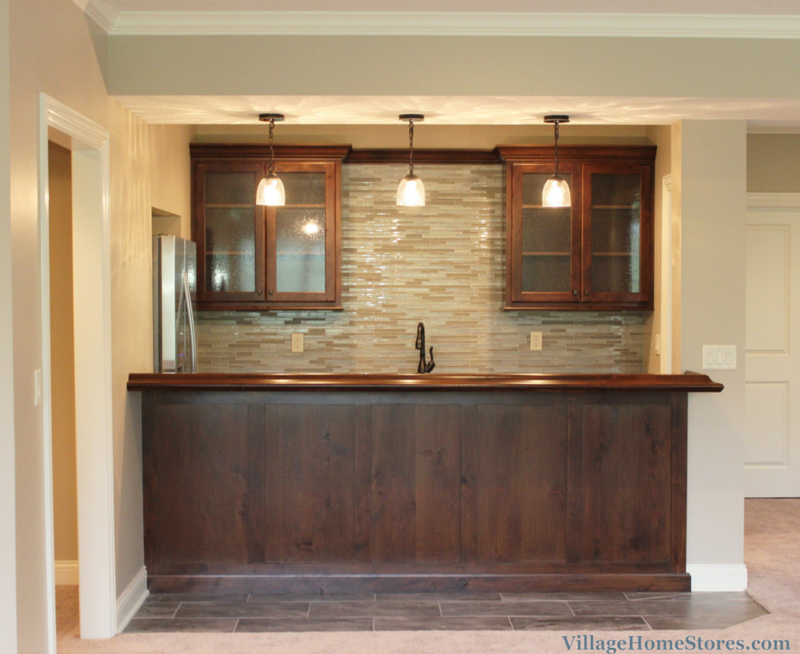 A great wet bar design doesn’t have to break your budget or strain your decision-making patience. Give your space just a few distinct features and then sit back and enjoy it! 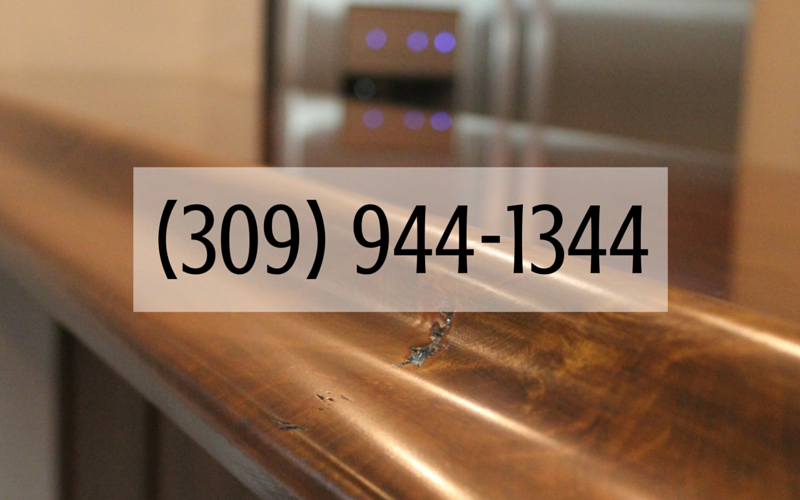 The easiest way to complete the look of any wet bar is to include matching wood paneling. This gives the bar a more solid look. Imagine if the wall underneath the wooden bar top was just painted the same color as the walls. This same bar would look half the size. Including wood panels in this design helps to anchor the outside of the built-in bar space and makes a firms statement that there is not just a back bar but as front bar as well. This paneled look was acheived with a smooth panel, finished flat stock pieces, and furniture base molding. 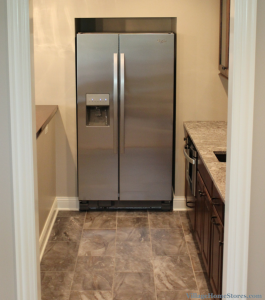 The wet bar includes a refrigerator recessed into the joining wall of the U-shaped space. 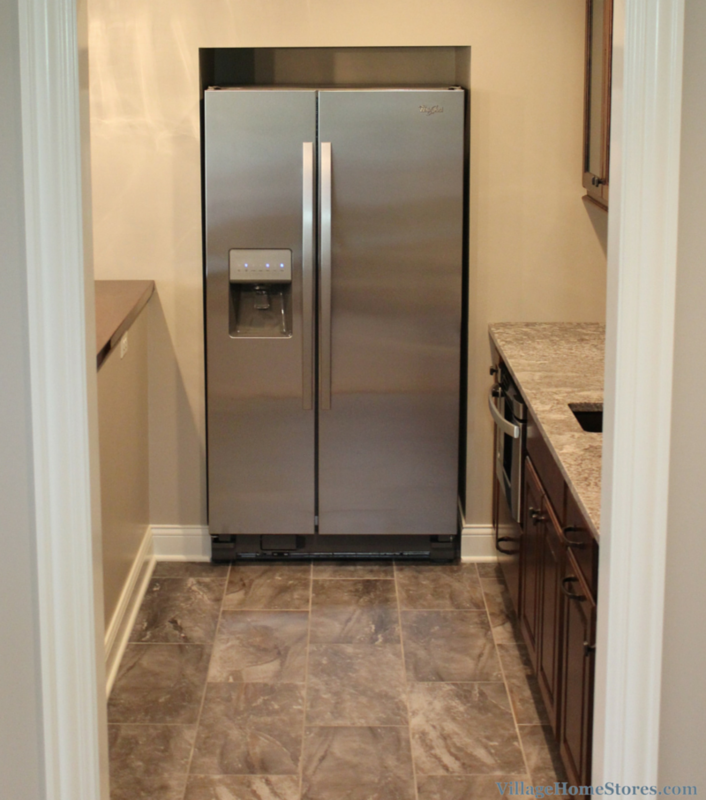 Creating a customized recessed area here allows for a standard-depth refrigerator model to be selected. A customized look is achieved using standard materials. Counter-depth refrigerator models do typically cost more than standard models. The difference in storage space within is just as important to note. This same space could accommodate a counter depth model with just 20 cu. ft. of storage. Instead, a standard Whirlpool side by side with 25 cu. ft. of storage rests in its designated area. Recessing the refrigerator also helped the back bar get a great look. A more symmetrical layout was achieved by centering a sink base on the back wall and framing in the space with two glass-front wall cabinets. 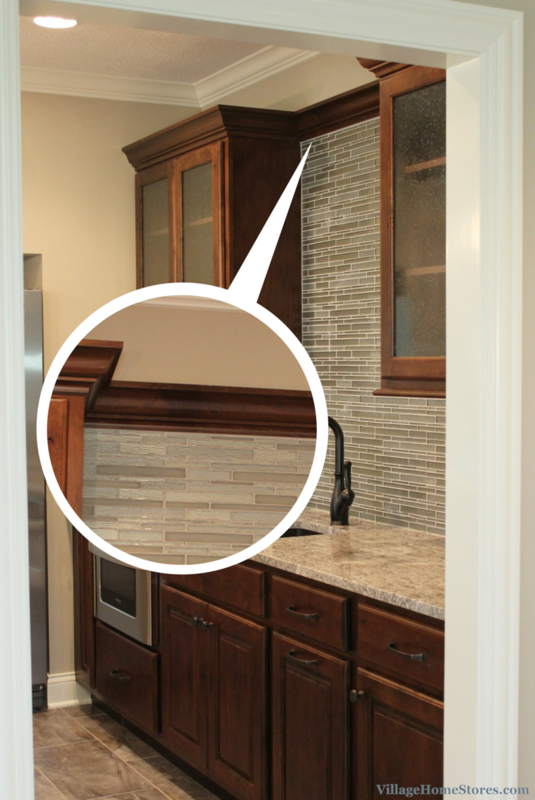 A mosaic tile has been installed below the wall cabinetry and spreads into the center section. In place of a valance or a center cabinet, the crown molding stretches across the top from wall to wall. This gives the perfect way to “cap” off the tile. 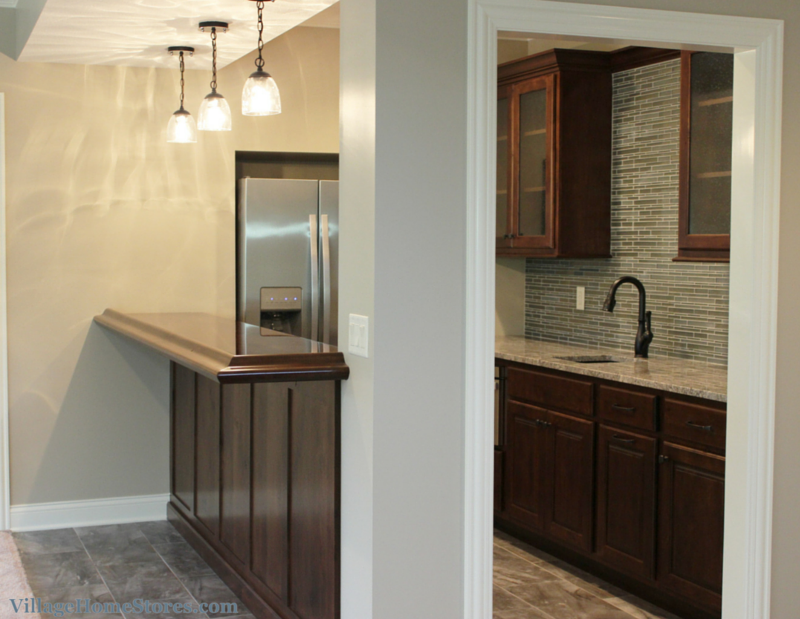 Deciding how or where to end a backsplash tile installation can often be difficult above sinks. 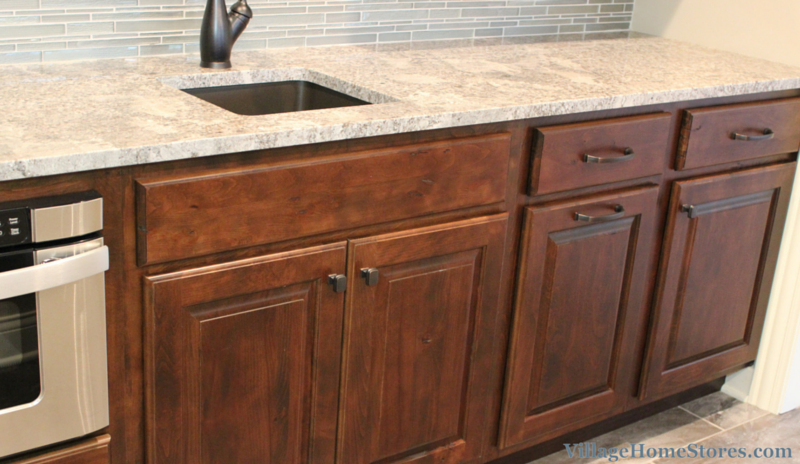 There are commonly unique cabinets or a windows above the sink and that can create odd exposed areas of wall. We love the look of this filled in space. This area is now perfect for hanging a large wall clock, mirror, or framed artwork. The base cabinetry of the back bar includes a space for a microwave drawer and pull-out trash bin. 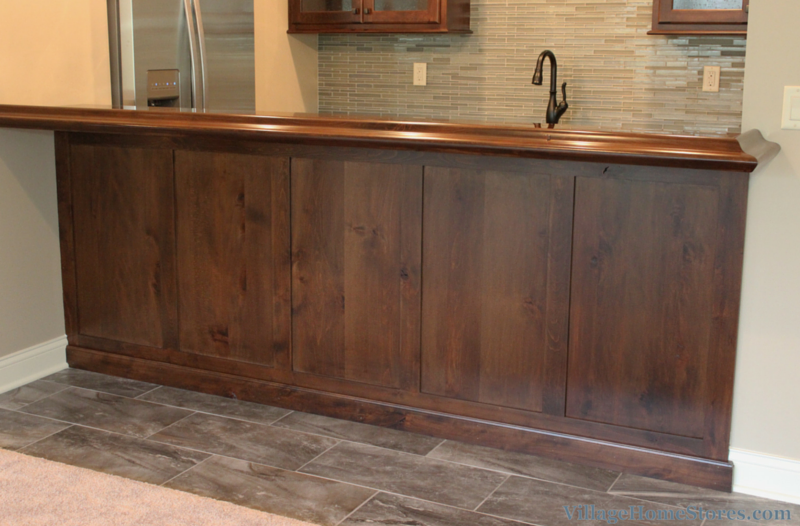 The cabinets used in this wet bar design are a Rustic Beech wood finished in a “Mocha” stain from our Koch Classic line. Rustic Beech is an economically priced wood species and takes stain similar to a Birch wood. The rustic features (like knots) add character and detail to the space. The rich “Mocha” stain paired with Oil-Rubbed Bronze hardware and faucet help make this “rustic” wood look high-end and dramatic. The wall cabinets on each end of the back bar have been ordered with the center panel cut for glass. 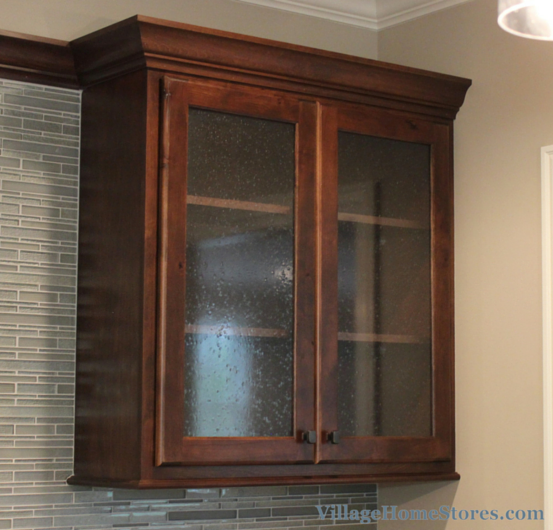 A textured glass has been custom fit and sealed into place to allow the cabinets to become display areas. Textured glass is a great selection for this type of display cabinet. It allows you to see that items are being stored within but it can be difficult to make out what the items are. That way if you have a stack of paper plates behind the glass, it looks no different than if it were a vase or a bowl. A detail that looks great but can be forgiving in a multi-purpose space like a wet bar. Because of their location, many times wet bars are home to a lot of “overflow” bulk items or seasonal items. Use this opportunity to include as much storage as possible. The important thing is to have a great space to join your guests when entertaining. The bar top itself should be large and well lit. 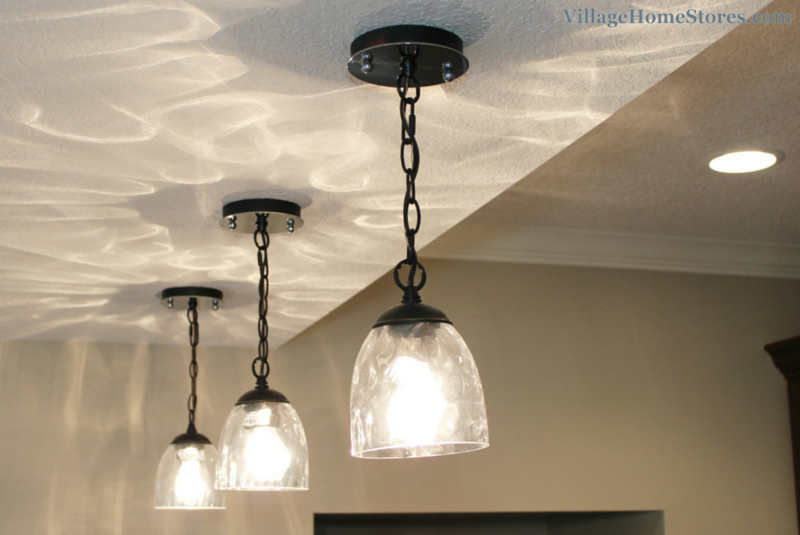 Our lighting expert selected these three “Kent” pendant lights by Artcraft Lighting to hang above the bar top area. The Oil-Rubbed Bronze finish paired perfectly with the other selections. The light that comes from these pendants isn’t just impressive on the bar top. Take a look at the display of light that the “hammered” glass casts on the ceiling above. Selecting the right lighting for a wet bar design can truly set the tone for the entire space. The pendants are the perfect size and scale. The added textured detail to the glass gives a playful showcase of light. Details like these help take a basic space and make it breathtaking. See the full album of photos from this Bettendorf, IA bar here on our Houzz.com page. Do want to make sure that all of the areas of your new home or remodeled space look perfect? Every detail considered as important as the one before it. Let us help build a team of experts to start the conversation with you about your project. We will be with you guiding you every step of the process. Take the first step by contacting us for an appointment. Call us at (309) 944-1344 or click here to complete the online form. We can’t wait to hear what you are working on.